There's a place in my heart for the International House of Pancakes. Doesn't matter what location (for the most part). My favorite one is where I'm constantly trying to convince Mark to take us as a reward for a good morning workout after the gym. The best brunch- when I close my eyes and imagine my go-to order at IHOP: steak tips and eggs (poached, cut them in half over your hash browns and drizzle a little hot sauce over that mmmhmm), the neverending coffee, and pancakes with sprinkles on the side, with whipped cream on top. I put my favorite dream breakfast aside this week, when I heard that a new type of french toast debuted, using Kings Hawaiian Rolls. If you've ever put that fluffy goodness in your mouth- I understand you. So I tried the bacon, sausage combo with that new french toast with strawberries and bananas. 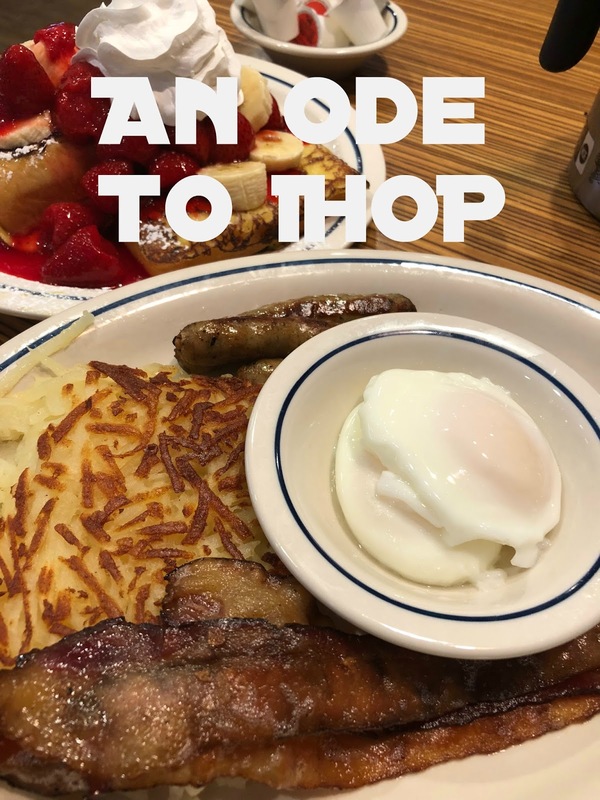 This is an unapologetically focused description of just how much I value these ideas and breakfast executions- keep doing you IHOP.